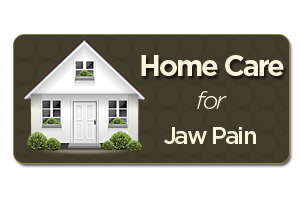 There are many things you can do immediately to relieve TMJ/jaw pain. Adjust diet: Eating softer foods helps relieve pain and lets the joint rest which can help with swelling too. Avoid gum, raw vegetables, big sandwiches, etc and choose softer foods like oatmeal, yogurt, smoothies, and soups instead. Our blog has a regular recipe feature with soft food ideas. Having a good blender, immersion blender, and/or juicer can make things much easier. Address Clenching & Grinding (Bruxism): If you clench or grind your teeth, stopping these habits can help the jaw rest and the muscles heal. If you grind or clench during the day, set an egg timer to go off frequently and assess whether you are grinding or clenching. After constant intervention you will become used to not clenching or grinding at all. Other treatments that have been successful for patients with bruxism: prescription muscle relaxants, stress reduction and coping techniques, changes in sleep patterns and positions, etc. For more information, we have a detailed article about bruxism. Take Over the Counter Medication: Over the counter medications like Ibuprofen (Advil or Motrin), Naproxen (Aleve), and Acetaminophen (Tylenol) can be taken to relieve TMJ pain and reduce swelling. Your primary care doctor or dentist can also prescribe other medications to relieve jaw pain like muscle relaxants, non-steroidal-anti-inflammatory drugs, opiates, and anti-depressants. Always take medications as prescribed, and contact your doctor or pharmacist if you have any questions. Avoid putting undue stress on the jaw joint from yawning widely, resting the phone on the jaw area, holding your jaw with your hand while leaning, or slouching at the computer. If you need to be at the computer for long periods of time, set a timer so that you are moving around and are constantly reminded that posture is important and can contribute to TMJ pain issues. Apply moist heat and ice: Moist heat and ice are probably the most popular, quickest, and cheapest things you can do to relieve jaw pain right now. Most TMJ disorder, facial pain patients have a preference of whether ice or heat works best for them, so in the beginning, experiment with both to see what relieves the most pain. You can easily make your own heating pack by filling a tube sock with uncooked rice and microwaving it.